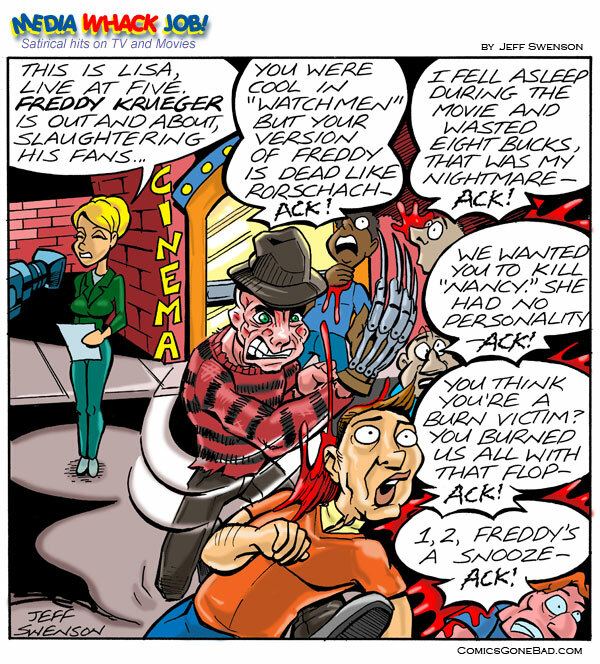 A parody cartoon of Jackie Earle Haley’s version of Freddy Krueger. I was so looking forward to this reboot of Freddy after seeing Haley in The Watchmen. I don’t blame him for this disaster, I blame casting, the writer and the director. Where are the fantastic dream sequences? Where’s the charisma of the female lead? Where’s the fun? Hopefully, Haley will be given a second chance with a better director and a better script. After all, Freddy 2 wasn’t great either but then 3 came along and ended up being a classic sequel.